To our surprise and excitement, the holidays are nearly upon us! 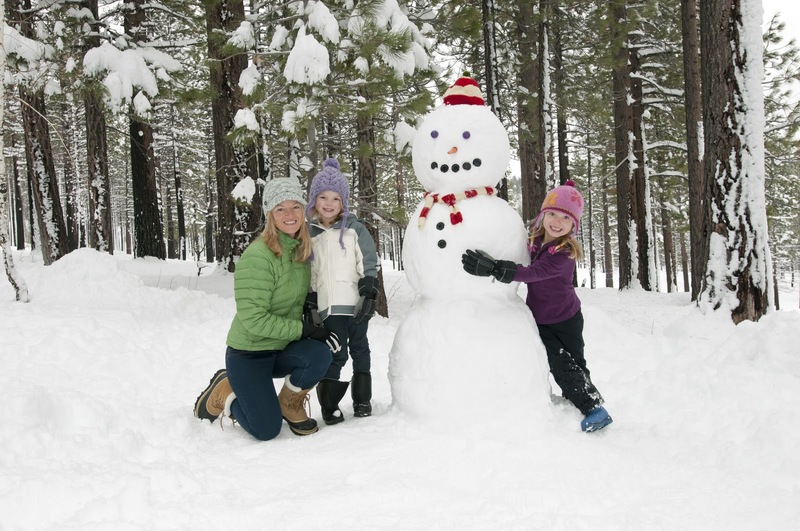 With reports of snowfall already hitting the airwaves and real sightings of snow at the ski areas, Thanksgiving Weekend is bound to be fun for families visiting Mt Hood. If you’re planning on spending your Thanksgiving vacation in a Mt Hood Vacation Rental, you can certainly expect to have a seamless and relaxing weekend because our cabins, lodges and homes are perfectly equipped for the holidays. 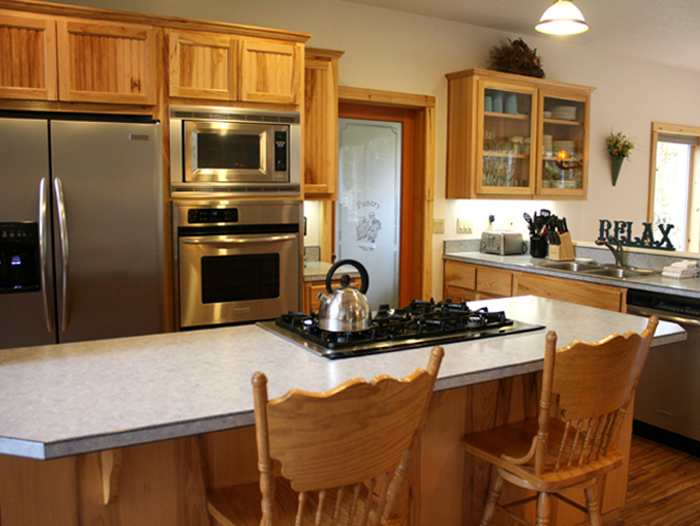 For our guests who will be preparing a traditional turkey dinner in their Mt Hood Vacation Rental, we have made it easy for you with kitchens that are completely stocked with all the pots, pans, dishes and utensils you need to make a big family dinner. From casserole dishes to pie pans, blenders to platters, wine glasses to bread baskets, the only additional items you might want to consider bringing is a roasting pan and thermometer for your turkey. Also, if you’ve forgotten a food item (or just don’t want to haul all those groceries with you), both the Hoodland Thriftway and Mt Hood Foods in Rhododendron will be open on Thanksgiving Day. If you’re more inclined to sit back and let someone else do the cooking, there are lots of restaurants open on Thanksgiving Day. Drive up to Timberline Lodge for an intimate and delectable dining experience while you watch the snow flurry outside, and enjoy Chef Jason Stoller Smith’s root beer brined natural turkey. The Resort at the Mountain will be hosting an extravagant Thanksgiving Buffet from 11 am to 7 pm featuring turkey with apricot-pistachio stuffing among many other delicious items. Later in the weekend, visit the Rendezvous Grill for their 2nd annual Holiday Open House and Wine Tasting from noon to 5. Preheat the oven to 375 degrees. Cut the squash in half lengthwise and place halves, flesh side down, in a baking dish with enough hot water to come 1/4-inch up the sides of the squash. (The water prevents burning and helps steam the squash so it cooks more evenly.) Cover with aluminum foil and bake until the squash is soft when poked with a knife, 1 to 1 1/2 hours. Discard the seeds. Scrape along the pulp with a fork and pull out and reserve shreds. 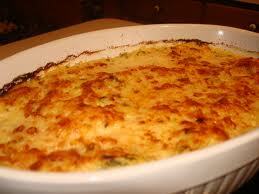 Rub the bottom of a medium (8-cup or slightly larger) gratin or baking dish with butter. Toss the "spaghetti" with the chopped sage, garlic, 2 cups of the cheese, cream, salt and pepper. Spread mixture in gratin dish (the squash layer should be about 1 inch thick). Sprinkle the remaining cheese over "spaghetti." Arrange the 3 remaining sage leaves on top of the gratin. Bake for about 45 minutes. Sprinkle freshly ground black pepper over gratin and serve. Note: The squash can be baked a day ahead, following the above directions. If the top of the gratin doesn't turn golden brown, place it under the broiler for about 1 minute. Add olive oil to a large saute pan, add the onions and celery and saute over medium heat until soft. Add the sausage and cook until the sausage begins to brown. Stir in the garlic and saute for another 1 to 2 minutes. Add the pecans, sage and rosemary and cook for another minute, then remove from heat. In a large bowl mix together the cornbread, cranberries, and the sausage mixture. Add chicken stock and stir until well mixed and corn bread is moist. Season with salt and pepper to taste. Transfer to a casserole dish. 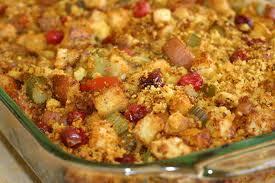 Bake the stuffing until it is hot all the way through and is crusty on top, about 30 to 35 minutes. Note: Bake this pie at least 24 hours in advance to allow the filling to set. Make your pie dough in two batches, dividing ingredients approx 60/40. 1. Place flour, sugar and salt in the bowl of a food processor fitted with the metal blade; process until combined. Add the butter pieces; process until mixture resembles coarse meal, about 10 seconds. 3. Turn the dough out onto a large piece of plastic wrap. Grasping the ends of the plastic wrap with your hands, press dough into a flat circle with your fists. This makes rolling easier than if the pastry is chilled as a ball. Wrap the dough in the plastic and chill for at least one hour. 1. Preheat oven to 450º. On a lightly floured work surface, roll out the smaller piece of pate brisee into a 15 inch round about 1/8 inch thick, dusting surface with flour to prevent sticking, as needed. Brush off excess flour. Roll dough around rolling pin, and place over a deep dish 9 inch pie plate. Line plate with dough, pressing it into the corners. Trim dough to within 1 inch of the pie plate. Cover with plastic wrap; refrigerate. 2. Roll out remaining piece of dough into an 18-inch round. Transfer round to a baking sheet. Cover with plastic wrap and refrigerate. 3. Place apple slices in a large bowl; sprinkle with lemon juice to prevent discoloration. In a small bowl, combine flour, sugar and cinnamon; toss with apple slices. 4. Place apple mixture into pie dough in pie pan, mounding into a tall pile. Dot filling with butter. Place dough round over the apples. Tuck edge of top dough between edge of bottom dough and rim of pan. Using your fingers, gently press both layers of dough along the edge to seal, and crimp as desired. 5. Using a paring knife, cut several vents in top dough to allow steam to escape. In a small bowl, whisk together egg yolk and 2 tbsp water to make a glaze. Brush surface with egg glaze; sprinkle with sugar. Place on a baking sheet to catch overflow juices. Bake until crust is golden, about 15 minutes. 6. Reduce oven temperature to 350º and continue baking until crust is golden brown and juices are bubbling, 60-75 minutes. Tent with foil during baking time if crust is getting too brown. Remove from oven and let cool completely.